On Tuesday I alluded to green happenings at Equinox Fitness Clubs around the country but didn't share any more than the event that included free entry for guests and an Earth Day party. Well, Equinox is doing more than throwing fetes to celebrate our Mother Earth, and they're only the latest company on the fitness front to be sharing their efforts (Vail Resorts is another that comes to mind, some marathons, and locally it's easy for me to remember the Fitness Formula Club's Gold Coast location's green roof deck). But anyway, it's Equinox that's getting the attention this Earth Day with its environmental preservation actions. I don't know about you, but I'll have to look at these enhancements the next time I'm at Equinox. Amazing how the smallest things can have such a huge impact on our environment. 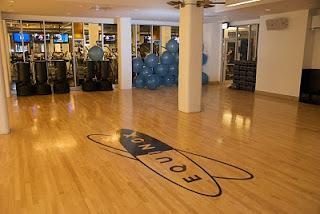 Photo of the Equinox Lincoln Park location provided by Equinox.